If you are new to the cryptocurrency world, then there is a big chance you are not aware of the intricate terminology and slang expressions related to virtual currencies. 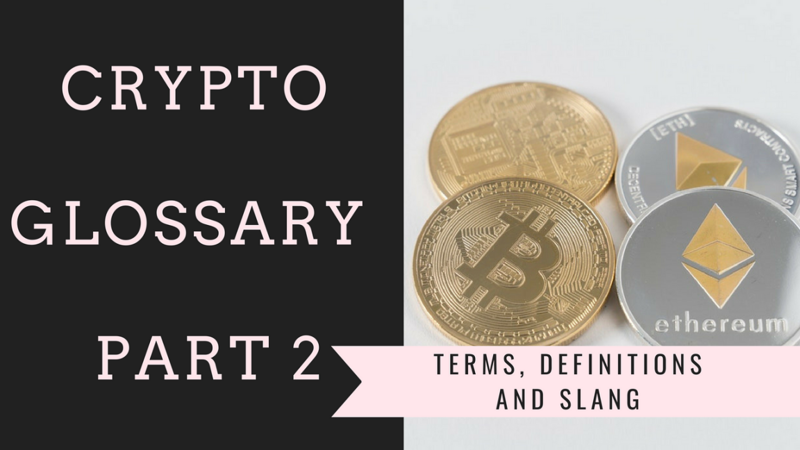 This is why, for your facilitation, we’ve created a glossary of the terms you should know to be able to decode the cryptocurrency lingo. You can find the first part of the list in our previous post. Without further ado, let’s dive into part 2. Distributed system – a system whose elements are located on different network computers, which communicate with each other and coordinate their actions. DYOR – Do Your Own Research. EW or Elliot Wave – a pattern used to predict price movements by analyzing crowd behavior and identifying wave patterns. It is used in technical analysis. Fiat money/currency – a formal currency, issued and declared legitimate by the government. Fork – basically a software or protocol update which creates an old and new version of the code. The cryptocurrency splits in two. Hard fork – creates a new blockchain where no interaction with the old version is possible and the transactions are not compatible. It is a permanent split that creates two different currencies. Soft fork – a split in two versions of the blockchain but it is backward compatible (which means that updated nodes will recognize old transactions and the non-updated nodes will see new transactions as valid). It is meant to result in one currency because the only one to remain valid. Going short –selling an item (before owning it) first and buying it later with the expectation that its price will drop. The trader expects to profit from the price difference when they sell at a higher price compared to the price they will buy it at later. The phrase is equivalent to “sell high, buy low”. Hash function – a cryptographic hash function is a mathematical process (of taking input data of any size and transforms it into unique output data of fixed size and the result is called hash. A hash is like a “digital fingerprint” of processed data and is irreversible. Hedge – protect against or reduce the risk of losses, by sticking to balancing and compensating transactions. HODL – the originated from the misspelled word “hold” mentioned in a long forum thread and gained popularity as an investment strategy. The meme became a part of the crypto slang with the implied meaning “Hold on for dear life”. ICO – Initial coin offering. It is a fundraising tool with which startups and new projects pre-sell their related newly-created fundamental tokens or coins in exchange for Bitcoin or Ether (or on more rare occasions some other altcoin). To some extent, this process is similar to the IPO (Initial public offers) with which traders buy stocks of a company. IPO – Initial public offering. A process with which a private company raises funds by presenting its stock for sale to the general public for the first time. Limit buy/sell order – order to buy or sell a set number of assets at a specified price or better (in the case of limit buy lower price and in the case of limit sell higher price). Limit orders define the maximum or minimum at which you are willing to sell or buy. Margin trading – borrowing capital from a broker to buy and trade assets which they otherwise cannot afford to buy. Market cap – word cap derives from capitalization, it is a measure of the value of an asset. The market cap is the estimated net worth of a cryptocurrency. It is calculated by multiplying the number of available units of a specific cryptocurrency by its current price per unit. Market order – an order to buy or sell straight away at the best available current price. A medium of exchange – tradeable instrument, representing value used to interchange for goods, services. It acts as a measure of value and standard of exchange.